Click the following link to read about Wreck of the Edmund Fitzgerald (the song). Big news! Summertime Dream to be released on audiophile vinyl. Read more and buy here. Here's another long overdue review; in fact, I couldn't believe that I had not reviewed it on Amazon in the late 1990s when I wrote most of my album reviews. But a search of my Amazon reviews reveals nothing, so today I will correct the oversight. In many ways this album needs no review. 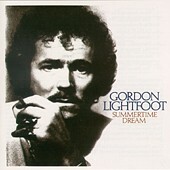 Although the title song is "Summertime Dream,", the standout track — and one of Lightfoot's best songs — is "Wreck of the Edmund Fitzgerald." Although the song is available elsewhere, there is something special about hearing it as it was first presented: the second song on the album following the unbelievably fantastic, "Race Among The Ruins," just as it did in concert during the Summertime Dream tour. Few people list "Race Among The Ruins" as one of his greatest songs, but it is (a bit of editorializing here, but it's my site and so you get my opinions). Even devoted fans often fail to mention it, but then when asked about it they say it's a great song. It was a thrill for me to hear the song live again at the Massey Hall concerts in 2012. Another gem on this album is "The House You Live In," which was Gordon's mother's favorite song. It's one of mine too: a metaphorical look at US immigration policy. "And the house you live in will never fall down If you pity the stranger who stands at your gate"
Amazingly, there are other great songs on this album, although the three above are my favorites. There's "I'm Not Supposed To Care," a bittersweet song of a failed relationship which Bob Dylan performs in concert (to my knowledge, Gordon does not perform it, although he may have when the album was first released). The other songs are very strong as well; they just don't speak to me as much as the four I have named here. I know that "Spanish Moss" is a favorite of many people, and probably the other songs - "I'd Do It Again," "Never Too Close," (which Gordon performs frequently to this day), "Protocol," the thought provoking, "Too Many Clues In This Room," and the title track itself, "Summertime Dream" are somebody's favorite. Understand that I didn't discover Lightfoot until 1976, and saw him in concert for the first time in 1977. I was, of course, blown away by the concert (still featuring the songs on Summertime Dream), and went out and bought my first two albums: this one, and Gord's Gold (his two latest albums at the time). After that, as they say, the rest is history. If you don't already have this album, you should do something about it! If you want a physical disk, you should probably buy sooner rather than later.